I just started to use Classic Shell on my clean install of Windows 10. Classic Shell is terrific! Thanks for creating it. 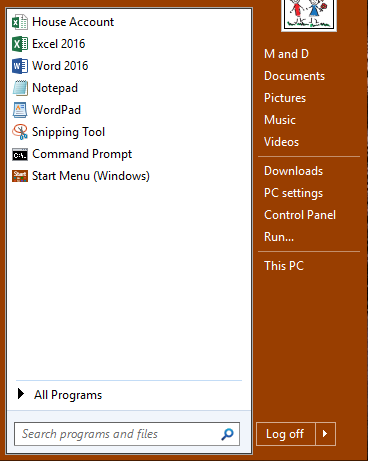 In the Windows 7-style Start menu with the Windows 8 skin, I don't know the correct name for the right side of the Start menu, where one normally sees Documents, Music, Pictures, etc. For now I'm going to call it "the right side." The right side of my Start menu is quite narrow - just wide enough to fit the labels. Is it possible to make it wider? I found the setting for making the left side wider or narrower, but I can't seem to do this for the right side. The right side is intended to be just wide enough to fit the labels. That's how it works in Windows 7. Do you see how narrow the right side is, and how little space there is between the lines? How can I make my Start menu look like the one on Classic Shell's home page? The spacing depends on the selected skin and other factors - like the DPI you use or if you have a touch screen. If you want to customize that you may have to edit the skin file and increase the padding. Oooh, I love to tinker. And I see that I can backup and restore my settings, so if I tinker a little too much I can always go back to the way it was. Thanks for your help. Determine the skin you are using: e.g. Windows 8.skin7. Download and install the freeware app Resource Hacker. Open Resource Hacker as administrator. In Resource Hacker, open the skin you are using by going to C:\Program Files\Classic Shell\Skins and opening Windows 8.skin7. Press Ctrl+F and find the term "Main2_text_padding" in the Skin resource. The 4 values of the Main2_text_padding parameter determine its padding from left/top/right/bottom of the right side column. You can adjust the padding to increase the spacing vertically or increase the space on the right or left. First off, thank you Ivo for making this absolutely wonderful resource! Can't believe I only learned of it today. One of my biggest UX gripes about moving from XP to 7 a few years ago was the fact that the windows key automatically prompted search, killing my Windows key, E workflow to open up email (and similar quick launches for other programs). Turning off the search bar required some serious tinkering (with registry, if I remember correctly) to turn off all Windows search functionality entirely, so that was a terrible option. Brilliant solution to trigger search upon tab! Nicely done - I can't praise this enough! Thanks also Classique for asking this question - funny that my immediate, first concern about Classic Shell also happened to be the most recently asked topic. 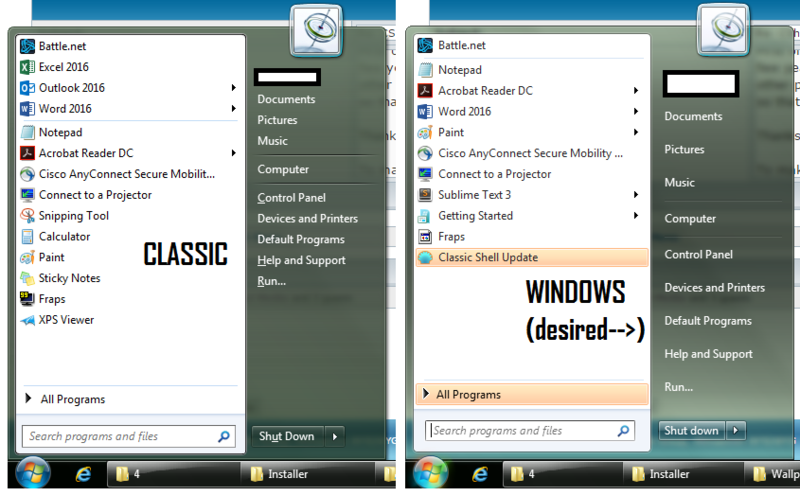 The right-side image shows the original, Windows Start Menu, which is how I'd like the folder links to look. 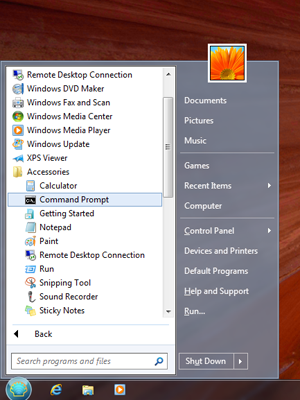 The left-side image shows the Classic Start Menu, where the folder links are condensed into small text along with the program links at left. The issue comes about from checking the "Small icons" setting under the default Windows Aero skin. The folder links get shrunk along with the program links instead of keeping their larger, relaxed shape. 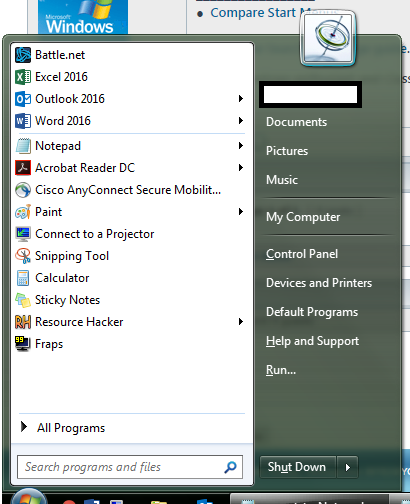 The folder link spacing when "Small icons" is unchecked is correct, but then the program icons at left blow up in size. I'll try to mess around with the skin file and try what Gaurav suggested above. Update: Increasing the Main2_text_padding from 1,7,8,7,100% to 1,20,8,20,100% seemed to have no effect on the spacing at all. Awaiting further help as I am completely unfamiliar with Resource Hacker and editing skin files. I edited the Windows Aero.skin7 file (I'm on Win7, using the Aero theme/Classic's Aero skin), renamed it Windows Aeromod.skin7 when I saved it, selected it from the settings menu, and it still looks exactly the same. Hope someone can figure this out! If you are using Small icons (if that option is checked in Skin Settings), you must modify Main2_text_padding values under the [SMALL_ICONS] section in the skin. On a side note, I also discovered today that Quick Launch still exists in Win7 (and 10), albeit hidden from plain view. Finally brought it back after 3.5 years without on Windows 7, and now I can once again launch a new Explorer window or Word doc with a single click. Between this and the start menu, I feel like I am finally in full control over/comfort with 7 as I was with XP for so many years. Thank you!! Just quoting you to make sure you see Gaurav's tip. Last edited by Lanturn on Fri Jan 20, 2017 11:24 am, edited 2 times in total. Thank you - that worked like a charm! It can be used to bring back Windows XP-like Taskbar behavior. Thanks for the resource, but I think I'm all set. I pretty much only used the taskbar to open programs, but now that I have Quick Launch I'm not terribly concerned with customizing it further. The appearance (small icon, window name, never combine) looks good enough to me as is and I use alt-tab for all my switching anyway. Oh oh ... changes have been made to this script. Do I wish to compile it? EDIT: Yes, I do. I also want to modify the resource. That change succeeded in increasing the padding between the labels. However, the right side of the menu is still narrower than I would like. Which parameter increases the overall width of the right side? There's Main2_padding, Main2_text_padding, Main2_icon_padding and Main2_arrow_padding. Yes! And as the very helpful comment section of the skin file describes it, the right side of the Start menu is called the "Second column." Changing Main2_padding from the default 3,10,5,9 to 3,10,9,9 widened the second column to just where I like it. Now that I've entered the world of resource hacking, who knows what mischief I'll get myself into?